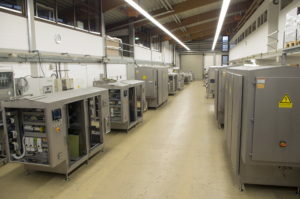 The Elea manufacturing and assembly facility at Quakenbruck, Germany, is currently very busy completing a number of systems for delivery over the next 6 – 8 weeks to customers in Asia, North America and Europe. It has been a good start to the year with plenty to do and a number of different systems making the work interesting and challenging for everyone. We have built our systems to customer specifications with extended outfeed conveyors, change components, and tight delivery schedules, all of which we pride ourselves on achieving. We currently have over 40 personnel working in various departments, including design, electrical, mechanical, and software programming. We also have a dedicated installation and field service team that inspects all systems prior to delivery to the customer. It’s a great team that works together and meets the challenges set by our customers every day. We are looking forward to a busy year with some new developments, including our SmoothCut One system which is currently being tested.